One weekend morning, as I sipped my coffee and scrolled through my Twitter feed on my phone, I came across The Smile Epidemic’s Twitter feed. I immediately knew that I needed to feature them for Philanthropy Friday. I contacted Jim Moss, the “smile guy” himself. I had to hear what we was doing over there in Canada. The Smile Epidemic describes itself as a “social research project based on our shared digital gratitude journal.” The concept is simple. Your task is to be mindful of the simple things in life that bring you happiness. By taking note of the those little things that make you smile for 30 days in a row and posting a picture of yourself on their website with a note in front of your smile, you can change the way you look at the world. A public gratitude journal, if you will. Over the phone, Jim told me “simple things make a big difference.” He noted that if we appreciate the simple things, we can erode the bad. This whole epidemic started when Jim, a former lacrosse player, became ill 3 years ago. He would have difficulty walking and discovered he had a muscular neurological disorder. At one point, he had to learn how to walk all over again. Certainly not a positive time in a former high level athlete’s life. From then on any time his legs would start bothering him, he would wonder how much the disease would progress. His mind went straight to the worst case scenario. But something happened that changed his perspective on his disease and his life. He heard the sound of his kids laughing in the bathtub down the hall as he worked on a paper for his psychology class. It was then Jim realized that he should be thankful that he could hear this wonderful, happy sound. The fact that he wasn’t in the hospital was something to be happy about. Because he didn’t have time to write in his gratitude journal, he took a picture of himself with a smile written on a piece of paper. He posted it on Facebook and went back to his studies. He took a few of these smile pics after that night and posted them on Facebook. He found that people really enjoyed the pictures and started to send their own pics back. And that’s when The Smile Epidemic was born. Jim is now working on his thesis in psychology based on gratitude at Wilfred Laurier University in Waterloo, Ontario. He says we can improve on the typical ways in which we keep a gratitude journal. By making our gratitude journal public using social media, we can increase social support and thus improve its effects. What seems to be a pivot point in recovery, as Jim saw first hand, is the act of noticing something that you are grateful for vs. the focusing on the things that you don’t have in your life. The conversation was fascinating, and I immediately saw how Jim’s “30 days of happiness” could benefit everyone from my son’s 2nd grade class to the women at the addiction treatment center I work with. But Jim pointed out that I really needed to experience it myself in order to understand. And I agreed. I can honestly say that I feel happier after my 30 days. And what I realized was that no matter what happened on any given day, there was always something to smile about. Always. Even on the day my 3 year old came down with a nasty stomach bug, we still were able to get a very nice family walk in. My oldest son, G, took many of the pictures for me. He loved reading what I smiled about and often asked me about it, before I even brought up the fact that it was time to take my picture. We had some good conversations at the dinner table about the things that made us happy during our day. 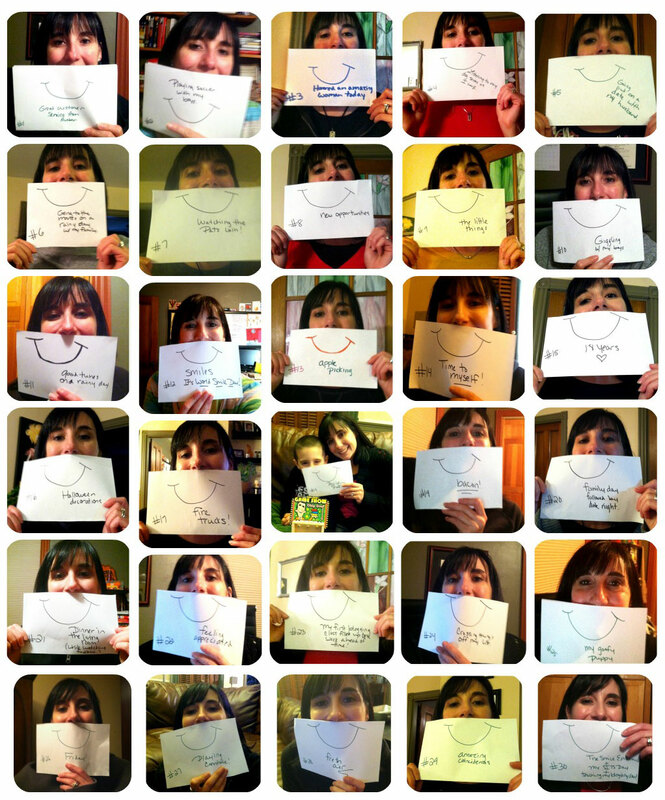 Heck, just looking at The Smile Epidemic website makes me smile. So, what are you waiting for? Start your #30daysofhappiness. I promise your perspective will change, even if you already feel pretty happy. Melissa recently posted..Do you have a paintbrush for your dreams? It’s really awesome, Melissa. Noting what makes you smile every day makes you realize that there’s always something to be happy about. Even on the bad days. Your post! This post made me smile. How wonderful!! Life has been rough on us for the past year, but one thing I always notice is that there is a smile to be found every day! The laughter of my children is certainly one of the best. Love this and can’t wait to join in on the epidemic! That’s awesome, Tamara. Doing this sort of public gratitude journal definitely helps put things into perspective. I hope that things get better for you! Fascinating post!! What can be better than a smiling face? After all, laughter is the best medicine. It can heal all the problems of the world so easily. It is true that life sometimes seems to be difficult for us but it is not limitless. After the difficult part there comes the beauty of life. So we should accept the situations in easy way. I absolutely love this idea. I’m thinking of trying it out myself. Thanks for sending me the link! Venassa recently posted..Baby Skinny Jeans? anotherjennifer recently posted..I’m ditching my kids for fun. on Halloween. I hopped over here from your Muchness post. I love this, too! You always find the best things to post and get involved with. I want to be your bestie!